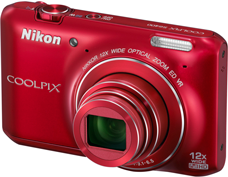 Nikon Corporationannounced the release of three new COOLPIX S-series models that incorporate advanced functions in a stylish design. They are the S6400, S800c and S01. The S6400 is equipped with a backside illumination CMOS image sensor with an effective pixel count of 16.0-million pixels, a 12x optical zoom NIKKOR lens with coverage for angles of view for focal lengths from the wide-angle 25 mm to 300 mm (equivalents in 35-mm  format), and a touch panel for natural operation, all in a compact and slim body. In addition to excellent basic camera performance, the S6400 offers a number of advanced photographic functions that ensure recording of images as intended with the simplest of operations. Chief among these functions are Target Finding AF, with which the user need simply point the camera at the intended subject and the camera automatically identifies and focuses on that subject; Quick Effects, which allow users to create images with special effects in just three easy steps–shoot, select, and save; and functions for recording full-HD movies with superior picture quality. 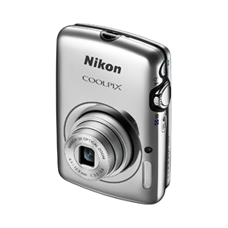 The S01 is the smallest and lightest digital camera in the history of the Nikon COOLPIX series, combining the simplicity of a cell phone with the advanced capability for expression of a camera. The body is smaller than a standard business card, measuring approximately 77 mm wide, 51.2 mm high, and 17.2 mm deep, and with a weight of approximately 96 g, it fits easily in the palm of the hand. Special attention was also paid to the design of the camera and materials used. It has a smooth form, regardless of the angle from which it is viewed, and is constructed of a durable yet thin stainless steel that also enables a beautiful finish. The S01 is also equipped with a touch panel display and a user interface (UI) that enables intuitive operation easy enough for anyone to master. As simple operation was also a primary goal for this model, the UI offers a number of convenient features, including a four-section grid structure that anyone can easily master. 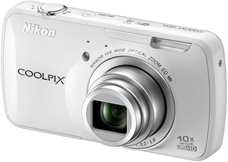 This is a camera that users will enjoy using and keeping with them at all times.